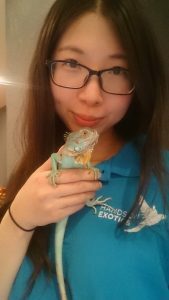 Meet the amazing staff at Hands on Exotics! Seth started Hands on Exotics in 2011 with his dog Opie, Zoe the macaw, and Peanut the lizard. In an effort to enrich the lives of his animals and socialize them on a regular basis he volunteered his time by bringing them to the residents of local senior’s homes. This turned out to not only be a positive experience for the animals, but also for the residents of these homes. The care providers of these seniors have never seen their residents light up as much as they did during these animal visits! Along the way Seth met many people and families who had animals that needed a new home. He realized that while there are many animal shelters and facilities that take in dogs and cats there are very few who can take in exotic animals like parrots, reptiles, and exotic mammals. Hands on Exotics is now home to roughly 150 adopted animals and continues to take in animals in need of a home whenever possible. Natalie first developed an interest in science education when she was working as a volunteer educator while completing her undergrad degree in Biology and Psychology at McMaster University. While at McMaster, she worked with a bat research lab, studying silver-haired bats and helping to care for a colony of big brown bats. She has since developed a passion for wildlife; completing a Master’s Degree studying song birds at the University of Western Ontario. She also gained experience working at a wildlife rehabilitation center, specializing in wildlife education. Kayla found us at a pet expo where she took it upon herself to help out all day and basically stuck with us since then! She worked first as an outreach staff with us before transitioning to more animal care. You’ll find her still doing some shows, but mostly tirelessly providing our animals all the loving that they need. At home, she has her own little menagerie of snakes, hedgehogs, dogs, and more! Rachel began gaining experience with animals while still in high school, when she volunteered at a veterinary clinic helping to care for their patients. She has since completed a Bachelor of Science degree from the University of Guelph, majoring in biological sciences. While in school, Rachel worked as a Wildlife Nursery Assistant in rehabilitation center, and was an active member of the Guelph Poultry Club. Vanessa developed an interest in animals at an early age from watching her favourite TV show Zoboomafoo growing up. In high school, she did a co-op placement at a veterinary clinic as an animal care assistant, and continued to work there after her co-op was completed. She then went on to graduate from the University of Guelph with a Bachelor of Science degree in Wildlife Biology and Conservation. 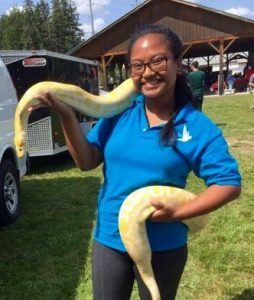 After graduating, Vanessa started to volunteer at Hands on Exotics, and soon became a member of the Outreach team as an Animal Handler and Educator. 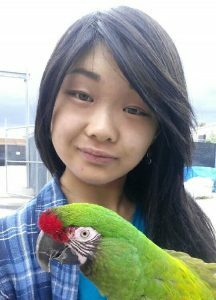 She enjoys working with a variety of animals and hopes to pursue a career in wildlife rehabilitation in the future. Lena dreamt of working with animals throughout her entire childhood, and often thought it was too great a dream to ever come true. She has since achieved her goals and is living that very dream! She is a graduate of the Animal Care program at Sheridan College and also works as a pet care specialist at PetSmart. 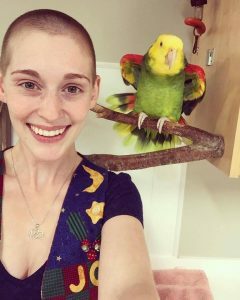 She’s completed a work placement at The Toronto Zoo, and before moving to Toronto she worked in education and rehabilitation at Hope for Wildlife, a wildlife rehab center in her home province of Nova Scotia. Lena loves having the chance to educate children and adults alike about the wonderful creatures that we share this planet with! She is the proud owner of a Siamese cat named Zuko, a corn snake named Ernie, and a hamster named Pumpkin.